We want help in interpreting the landscape of the area and the way in which people have altered it over the centuries. Do you know any stories or facts about natural or man-made features or places or things that happened around here? Do you know – or would anyone belonging to you know – any Irish fieldnames or placenames or terms for things? Why do we talk about capping cattle? What’s a bottle of straw? There is a ring fort on Faughil Mountain, facing Jonesborough in the dip close to the Molly Road. There is also a cillin, a burial place for unbaptised children – anybody know where? A polygonal enclosure 35m N-S x 39m E-W. Most of the perimeter is defined by a tumbled stone wall c.3m wide & 1m high. At N the interior is c.0.75m below outer ground level but at S the interior is slightly raised & the wall is only 0.5m high internally & 1.5 above ground outside. The interior is very overgrown, but many stones are visible, possibly the remains of structures or grave-markers. Paterson records that the enclosure was used within living memory for the burial of still-born infants. According to one local man, 50 years ago it was possible to catch salmon in the stream behind Bell’s Castle with a graip. There was a man from Edenappa who went down with the Titanic. I mentioned that to our fella and says he: “I knew it. I knew sooner or later they would blame that on us.” James Heslim worked as a trimmer (which actually involved shovelling coal into the engine furnaces) for Harland & Wolff and was part of a team that went out on maiden voyages. Everyone knows who painted the ceiling of the Sistine Chapel in Rome, but who built it? It seems that every diocese in Christendom was asked to send money, men or materials and there is a strong tradition that a number of stonemasons from around Crossmaglen headed off to throw up a few rows of blocks in Rome. On the Glendesha Road from Mullaghbawn to Carrive, near the junction with Lough Road, there is an old single-storey farmhouse which has been beautifully restored. There is an adjoining byre and loft which the owner tells me was built by the poet Art Bennett, who was also a mason. Just up the hill towards Belmont Barracks there is a plot of ground (not identified) where he tells me there stood a cottage where Oliver Plunkett hid out. On this page we will gather up what stories we can about the building of the railway through the parish. MacNeill was the architect for both the Egyptian Arch and the Craigmore Viaduct – the builder was William Dargan. Our section of the railway was built from south to north at commendable speed, so there must have been an enormous army of navvies. The line from Dublin reached Dundalk in February 1849 but there it stopped while the company sorted out financial problems, with government help – it cost £40,000 a mile to build, an enormous sum. Work restarted in late 1849 and by the following July it was past Killean at the Wellington Cut (The industrial archaeology of Northern Ireland, page 109. By William Alan McCutcheon, Northern Ireland. Dept. of the Environment). The section of embankment through Adavoyle bog is built on fascines – large bundles of brushwood, probably mostly willow cut in the bog itself. My father also said there were backhanders paid to change the route of the line around where Adavoyle Station is, to the benefit of one landlord rather than another (which would have been Chambre and Jones). As a result the line went through solid rock which had to be blasted (very expensively with black gunpowder, Mr Nobel had not yet invented gelignite).My father had a great railway story, which I think was about Rosie Morgan from down what we might call the eponymous Pad running from Dernaroy into Foughilotra. It seems she was a woman of intellngence, some education and a lot of ingenuity, widowed young with a large family. It was possible to rent lengths of the railway embankments or cutting sides to graze goats which had to be tethered. Rosie rented out two lengths on each side of the cutting. Rosie knew her law and found some obscure clause allowing her to fence her holdings. She then proceeded to build a ditch across the railway line. The trains stopped, there was a stand-off, the lawyers arrived, Rosie got paid off and the trains ran again. Can anyone throw light on this? For those of you who can remember the distinctive puffing rhythm of the old steam trains, going uphill they were supposed to be saying: “I think I can I think I can.” On the other side as they went downhill they exulted: “I done it I done it I done it.” But according to a venerated member of my family what the train was really saying on the long pull up towards Kilnasaggart was: “Damn and bugger Edentubber damn and bugger Edentubber.” The steam trains took on water at The Tank – an aquaduct filled from Smith’s Pond in Faughilotra. It was a huge tunnel of riveted sheet-iron that we used to walk through as kids. It got the wee touch in the 1970s and 10-foot chunks of the iron sheets landed three or four fields away. The cavalry was returning to the Curragh from Belfast where they had guarded the King as he opened the Northern Ireland Parliament. As I recollect the man shot dead was called McAteer. The Newry Journal says 40 horses were killed or had to be put down:http://www.newryjournal.co.uk/content/view/1111/31/ It also mentions local men being rounded up and forced to bury the horses. The way I heard it, they were rounded up again some time later and forced to dig the horses up and re-bury them. Where exactly did it happen? Most of the accounts indicate it was between the railway gates and Adavoyle Station (ie, in Foughiletra townland) but I have heard it was on the Ayallogue side of the gates. Someone must know what field the horses were buried in. Judging by the angle of Slieve Gullion it must have happened immediately south west of Ayallogue Bridge. King William III landed at Carrickfergus on 14th June 1690, bringing 16,000 men to join the 20,000 already in the field. His march south to do battle with James II (his father-in-law) was slow, not least because his generals expected the Jacobite forces to make a stand in or around the Gap of the North, which still had a fearsome reputation from the battles against O’Neill a century before. Indeed, it is believed James’s generals argued in favour of stopping the Williamites between Newry and Dundalk and that it was James himself who over-ruled them and decided to make his stand at the Boyne. However, substantial forces were brought towards Dundalk and some of them pushed towards Newry. James had many French officers supplied by his own father-in-law, Louis XIV. One of them, Le Marquis de la Hoguette, wrote from Ardee to the French Minister of War that 1500 soldiers were occupying “un chateau sur le grand chemin de Nury (a castle on the main road to Newry)” which sounds like Moyra Castle – but is it? There was another castle, at Flurrybridge or the Four Mile Water as it was known. It may also have been called the Halfway Bridge. O. Davies (1938) wrote that a small fort was erected there in 1624 to command the crossing of the Flurry. It was known as Waterfort but was also called Four Mile House. The site is unknown but Davies makes the sensible point that it was probably on high ground and the closest is to the east, beside the Carrickdale. Some of you may remember from the Walk Talks that when you see a castle, you should try to find the quarry the stone came from and a road joining the two. Neither is a problem in this case. The early Baby Boomers out there may remember that the Roadhouse, forerunner of the Carrickdale, was actually built in a quarry so there was stone close at hand. Saturday the 21st: a strong detachment of firelocks was sent out to a castle on the Newry road. At night 200 chosen men out of five regiments, being 40 of each, were sent to lie upon Newry road upon intelligence of some party of the enemy advancing. Sunday the 22nd: a party of horse under the command of Lieutenant-Colonel Dempsey,144 advancing towards Newry, fell into a body of the enemy and, being overpowered, retreated; till coming to the above said detachment of 200 foot under the command of Lieutenant-Colonel FitzGerald145 and finding them receive the enemy vigorously, they rallied. The rebels made no great resistance, our foot firing hotly, but fled towards Newry, the horse pursuing them a considerable space. Of the rebels above sixty were killed, of ours a few wounded and fewer killed, among which was Lieutenant-Colonel Laurence Dempsey, shot through the shoulder whereof he died. The causeway referred to is the ‘broken causie’ which figured so often in the accounts of the O’Neill Wars. On the main road just past the Edentubber turn there is a little narrow road on the left that runs north to Kinney’s Mill, parallel to the main road. This is the original road, which dips down towards the stream which marks the border. Drainage is still poor around there, but back then there was a substantial bog crossed by some sort of raised causeway, possibly with a wooden bridge or portion. It may have been known as the Five Mile Bridge although less than an Irish mile from the Four Mile Bridge. Armies of the time were trained to form up in fighting lines of 50 or 100 across if possible – they were vulnerable when strung out in columns for marching. The standard Irish ambush technique was to lie in wait at natural choke points – bridges, fords and bog crossings. The Davies article points out that the word Pass (sometimes spelt Pace) was used in the 16th century not to describe mountain crossings but valley crossings which were more dangerous. The causeway would probably only have been wide enough for two horsemen or four or five pikemen or musketeers. The ambush party would suddenly fire from the bushes and hope to punch a hole in the middle of the column so that it could no longer fight as a single unit. The ambush was not accidental – the Jacobites had observed that scouting parties were approaching the Half-Way Bridge every night. The fact that they had sent 60 Dragoons (horse) and 200 foot probably meant they intended to push on towards Moyra if they met no resistance. 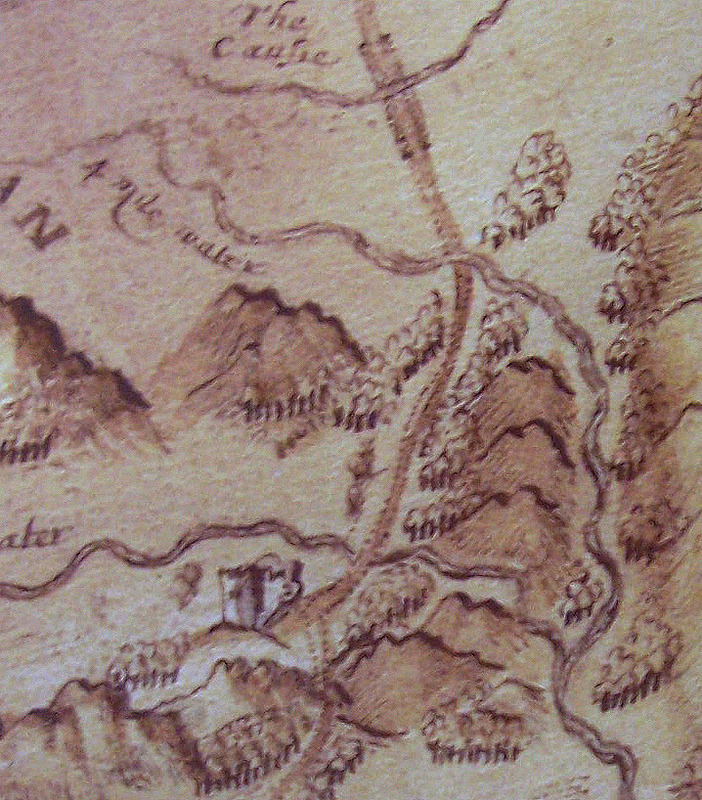 The ‘broken causie’ of Carrickarnon is shown in the sketch map below, which seems to be by our old friend Bartlett, the mapmaker to Lord Mountjoy. The battle of Moyra Pass took place over a number of days in early October 1600, but there was in fact a standoff lasting from mid-September when Lord Mountjoy first established his camp at Faughart, until he gave up and pulled back to Dundalk on 9th October. On 13th October for reasons which are still not known but are thought to do with other events in Derry and Donegal, O’Neill pulled out of the Pass. Mountjoy marched through unopposed the following day, dismantled O’Neill’s barricades, trenches and fortifications and began felling the woods and picking a site for a fort. Built in c.1790, this substantial Georgian Country House built was the prominent residence of Baron Mc Clelland on what was known as the “linen lease”. Such leases were established under the old Irish Parliament which gave authority to “limited owners” to grant perpetuity leases in order to encourage the linen industry (instead of a fixed period of 50 years). The building was designed by Thaddeus Gallagher, a local farmer and builder. Thaddeus’ son James, an architect, moved to New Orleans in the United States, changed his name to Galliger for an indefinite purpose and became one of the best and respected architects of his time, designing many notable public buildings within the city, including St Patrick’s Church. Anaverna is currently a multi-purpose establishment used to facilitate both theatrical and musical performances from many of the best acts in Ireland. 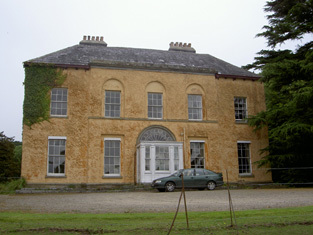 It is owned by the Lennox-Conygham family, formerly of Springhill, Co. Derry, who purchased it from a Mr. Cox, who in turn had bought it from the last of the Thompsons, who were descendants of its original occupant. A coat of buffalo-skin, worn by king (sic) William the 111, at the Battle of the Boyne, is now in possession of Robert Thomson, Ravensdale, Esq. It is perforated at the spot opposite the shoulder, in which the king had receive a wound from a musket-ball. It was the property of the late Mrs. Mills (grand –aunt to Mr. Thomson) who died a few years ago, in extreme old age, at Ravensdale. This lady husband had received it from colonel Wetherall; (aid-de-camp to William,) whose near relative he was. The colonel had aided it taking it off the king, with whose consent he had retained it, in memory of the transaction of his sovereign. Miss Mary Thompson who died in 1916 was the authoress of many poems, which were published in ‘The Nation’ and other papers, she wrote under the pen-name “Eithne”. Many of these poems can be viewed by appointment via the following hyperlink: http://sources.nli.ie/Record/PS_UR_093894/Details . In close proximity to the grounds of Anaverna, a path leads to an ancient circular stone built enclosure called “Lisnecheggle” (the fort of the rye) containing foundations of stone huts or cells.